General Motors Co. Chief Executive Officer Dan Akerson is looking to at least triple the company's target for electric-car sales by expanding the market for the Chevrolet Volt and adding models that would share similar technology, said three people familiar with his plan. Akerson, who took over on Sept. 1, told GM's executive team in early December to find ways to sell three to four times as many electric cars as planned for 2012 by mid-decade, said the people, who asked not to be identified because the plans are private. GM has said it expects to sell 10,000 Volts in 2011 and 45,000 the following year, when capacity may reach 60,000. Increasing Volt sales and developing other models with electric drive will spread out the cost of developing the technology across more vehicles. It also carries risk because hybrid and electric cars have tended to sell in low volume and be unprofitable, said Jim Hall, principal of 2953 Analytics Inc., a consulting firm in Birmingham, Mich.
Akerson's plan for more cars with electric drive underscores his strategy to differentiate GM and make it a technology leader, following an initial public offering that raised more than $20 billion in November, 16 months after the automaker emerged from bankruptcy. Akerson, 62, has told top executives that he wants GM to seek new markets and prepare for higher fuel prices, according to the people. 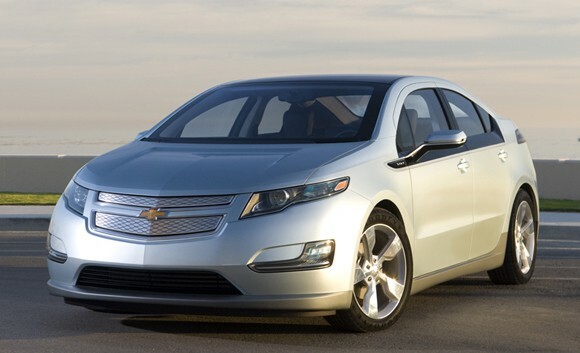 The Volt went on sale this month in the U.S. at a price of $41,000. The car, which can travel as much as 50 miles using batteries, will be sold in China during the second half of 2011. GM last month began taking reservations for the electric-drive Opel Ampera, which will sell in Europe next year. The models include a gasoline engine that extends the driving range to more than 370 miles. Dave Darovitz, a GM spokesman, said GM will look at other models for the Volt system. He declined comment on Akerson's volume goals for the technology. The federal government is offering consumers a $7,500 tax credit to buy the Volt, plug-in hybrids and electric cars. The credit begins to phase out after a manufacturer produces 200,000 eligible plug-in electric vehicles, according to the U.S. Environmental Protection Agency's website. Akerson, a former managing director of private equity firm Carlyle Group, succeeded Ed Whitacre as CEO in September and assumes the role of chairman at the end of the year. Akerson told his executive team to come back to him with a way to meet the higher sales numbers for the Volt and other electric-drive models, or with reasons why it can't be done, one of the people familiar with the plan said. GM is considering adding electric-gasoline Volt technology to several models under multiple brands, most of them larger than the Volt, including SUVs, according to the three people familiar with the plan. In April at the Beijing Motor Show, Chevrolet showed a five-passenger SUV that could drive in all- electric mode for 32 miles using the Volt's powertrain system. That kind of vehicle is one possibility, the people said. Making larger models using the same system is difficult and may be more expensive because adding features and passenger space will make the car heavier and less aerodynamic, according to two of the people. GM stopped work on a plan hatched by now- retired Vice Chairman Bob Lutz to make a two-door Cadillac sports car called the Converj that used the Volt's drive system, two executives with knowledge of the decision said in March. The Volt runs using only electric drive for the first 25 miles to 50 miles. After that a four-cylinder gasoline engine turns on and recharges the lithium-ion battery. The EPA rated the Volt's fuel economy at the equivalent of 93 miles per gallon in electric-only mode and 37 mpg if the car runs on gas after the battery is drained.